are what you need to design your very own paper airplane. A design for a paper airplane that performs stunts each time you throw it is necessary for you to be able to enjoy the plane. Whether it does barrel rolls, loops or climbs and dives - all depends on designing. Well let's start with our very first plane. The Easy Glide was built to basically float through the air (hence it's name). It is a very sleek airplane. The body and the wings are quite long and the overall width of this plane is not great. I also included a tail when designing this particular airplane which keeps the plane upright. Also the wing tips are folded down. The Easy Glide is a very enjoyable plane to fly particularly indoors (or outdoors with a small breeze) as it will fly a good distance. Let's now take a look at another airplane. This particular design was built more for constant enduring speed. It is quite an unusual plane which is slightly shorter than the Easy Glide. Again the body is sleek and has quite good balance, particularly in flight. This is assisted by the way the tail fold is done causing the wings to curve upwards. Some designs for paper airplanes can also be quite serious. What I mean by that is some people like to achieve great things and that includes paper planes. Did you know that there is a World Guiness record holder for the longest indoor paper airplane flight? His name is Ken Blackburn. The best paper airplane pattern can differ as it could be for speed, distance, stunts or style. One of my best would have to be The Swoop. This airplane is one that needs to be flown from a height. When you let go of The Swoop, it immediately goes into a nose dive and then climbs out of it before repeating another dive. 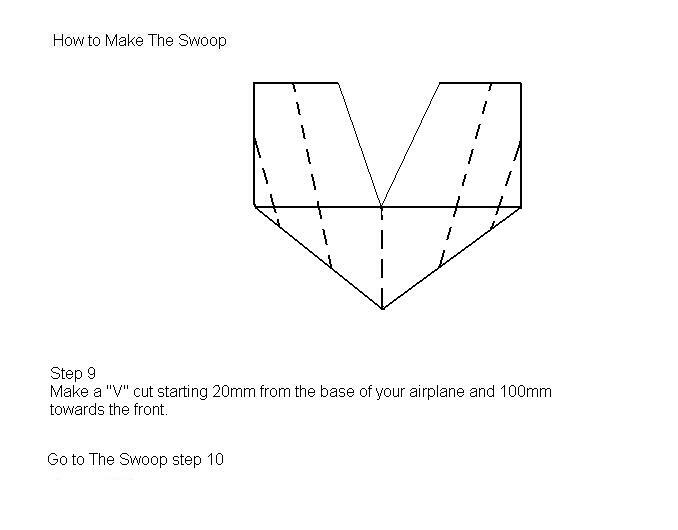 The design of it is quite different and possibly stretches the rules of paper airplane making as there is a section that needs to be cut out as can be seen in the above diagram. Sometimes it's good to be different! There is definitely one good thing about all the paper airplanes on this site. simple designs for paper airplanes. Of course if you are more than a novice or a beginner with making paper airplanes then you are able to progress to a more complicated design. However making paper airplanes has to be fun and a part of that fun is having simple paper airplane pattern to follow. Another thing that almost goes without mentioning.